Ratcliffe's career got off to a late start because of the Second World War. The Irish full-back played for Bohemains in Dublin for two seasons before joining the RAF in 1941, and during the war was shot down over Germany and spent two years in a POW camp. 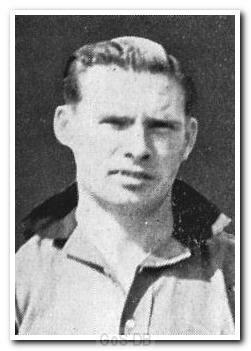 After hostilities ceased he returned to Bohemians for the first two months of the 1945-46 season before signing for Notts County. Without appearing for the Meadow Lane club, he moved on to Wolves less than a year later, making just two appearances at Molineux before being sold to Argyle in 1947. He was a cultured full-back who loved to get forward and deliver a telling cross, and was also a decent penalty taker. He spent nine seasons at Home Park with his success in England monitored in his homeland; he was held in enough regard to be asked by Bohemians to guest, whilst registered as an Argyle player, in an end-of-season memorial match for former manager Jimmy Dunne in May 1952. Leaving Home Park in 1956, he retired from the game at the age of 35 and emigrated with his family to the United States. Well this is my "Uncle Paddy", my Mum's brother. He was a rear gunner on Lancasters during the war and was shot down over a raid on Essen. He was taken to Stalag Luft Three, home to the Great Escape and the Wooden Horse escape. We lived in London but whenever Plymouth were playing in London, I would meet the team bus and Paddy would give me tickets for the game. He was a great bloke and went to Los Angeles to start the first English Soccer Academy. He never came back to the UK again. I remember that he had a couple of children, but we all lost touch with each other many years ago. Perhaps one of them may spot this and get in touch ... it would be nice. By the way, I am 70 and a Norwich City supporter and I see that Paddy scored the winning goal to put Ipswich out of the FA Cup. Good bloke.